I think we’re going to need a bigger army. So ends Chapter 15 ! 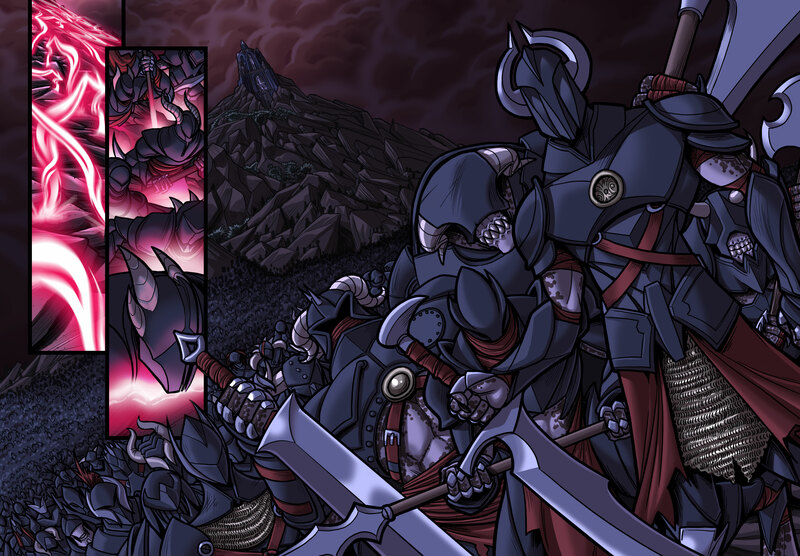 Next week, the final chapter of Impure Blood begins ! Nathan has been casually participating in TopWebcomics.com‘s sketch-a-day challenge. Just search the hashtag #TWCchallenge and/or follow @topwebcomics to see all the cool drawings by other awesome webcomicers. Today’s (Monday’s) challenge is special because it’s being moderated and retweeted by webcomics rockstar, half-Klingon, and all around nice guy, Lar DeSouza. He’s the award winning artist behind Least I Could Do and Looking For Group, and if you haven’t heard of those you must not read very many webcomics. Thanks for reading this one, though ! Any plans for after Impure Blood? Another comic in the same universe or something different? For the immediate future, though, I need a break form the weekly deadline, and we both have non-IB projects that we’d like to pursue. Rest assured, you haven’t heard the last from us.